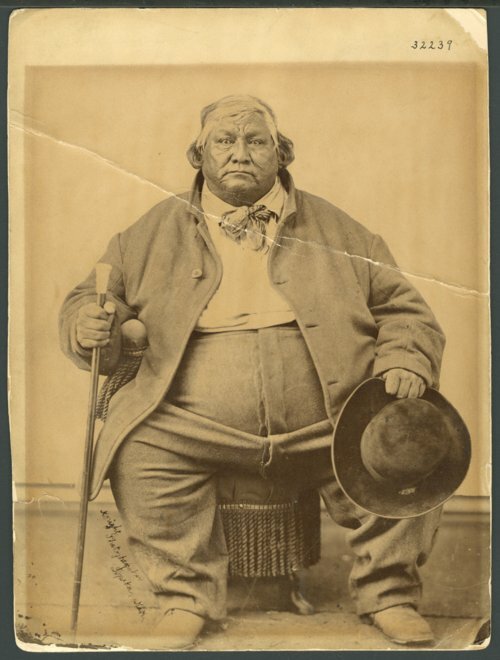 This is a photograph of Pottawatomie Chief (Nan-Wesh-Mah) Abram Burnett. In 1838, Burnett and his Pottawatomi bride, Dah-Moosh-Ke-Keaw, were removed with other Mission Band Pottawatomi to a reservation in southeast Kansas. His first wife died in 1842 and in 1843, he remarried Marie Kofflock, a German Catholic immigrant. In 1848 Chief Burnett moved to the area that was later to become Topeka. In Topeka, he farmed a large plot of land near Burnett's Mound along Shunganunga Creek and traded horses. He was a physically large and powerful man, reportedly weighing more than 450 pounds in his later years. He dressed in a coat and trousers and wore a tie when occasions demanded. He often wore a hat and carried an elaborate cane with a handle of rose quartz with a silver collar and an ebonised hardwood shaft, as shown in this photograph. Chief Burnett died June 14, 1870 on his farm near Topeka and his wife and children moved to the Pottawatomi reservation in Oklahoma.